I think a gym is a really fun place to try out a bold patterned floor. A pattern this intense might be a bit too much for a bedroom for example, but in a space where energy is literally required for exercise, I think it's a fun design decision. There are tons of ways to achieve a patterned floor- I used FLOR carpet tiles that come in pre-designed configurations (or of course you can customize your own!). When I think of typical gym designs, I think of clip on wall to wall mirrors, and not a ton of style. Consider adding details that would be applied in a residential setting- like crown and applied mouldings. 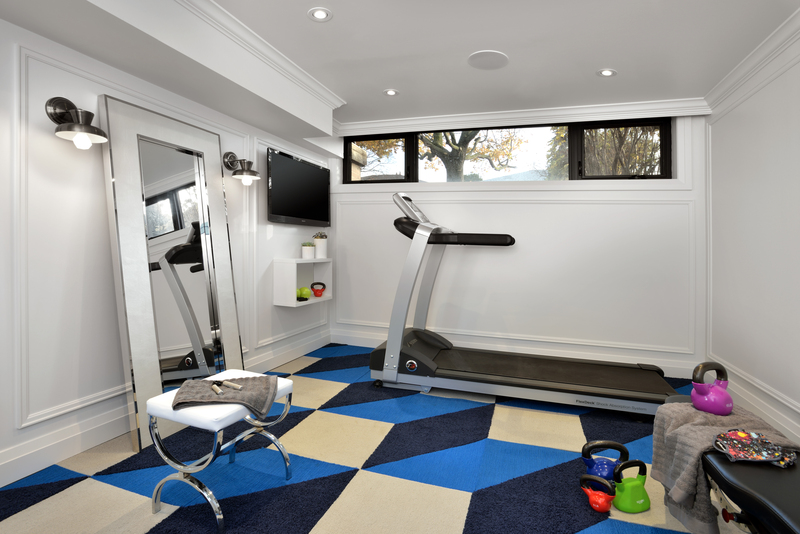 The level of elegance and modern edge when painted out a uniform colour is so fun and unexpected in a gym I argue- and bonus, if you ever want to convert the space back to a bedroom, it will be one elegant space. I used Metrie's Very Square collection for baseboards, crown and applied moulding. Again, instead of a wall-to-wall mirror, I opted to go with a casual leaning mirror (picked up for a steal at HomeSense!). You can check out your form and bounce off some light- but again it feels more residential and decor based than it does a commercial gym. I flanked mine with some really adorable (and also crazy inexpensive) sconces from Canadian Tire's Canvas colelction. I was a bit skeptical at how much we would actually use this fridge (our house is not so big that you can't walk next door to grab a drink). But when you've got a hundred kids like I do, and your "you time" is precious and few, it is pretty amazing to lock the door, crank the music, and enjoy a beverage uninterrupted. Keep the fridge stocked with bottles of water, apples, and if budget allows fantastic pressed juices- I love Juice Matters. This is an amazing element to factor in to your budget- the sound on our integrated Sonos system is so great- and so practical to exercise to as no cables or cords get in the way. Sonos players are controlled by your phone and we stream music off our iTunes account, Spotify or local radio. The sound is so robust and a fun addition to our mdoern home gym. What are your essentials when working out at home? Love to know in the comments below.